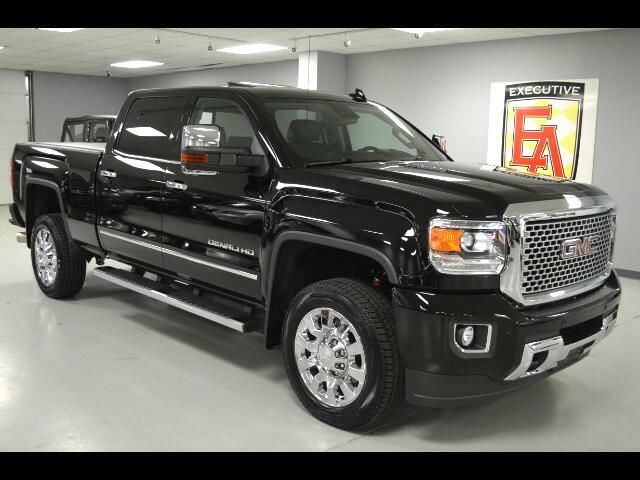 2016 Sierra Denali 2500 4x4 Crew Cab Onyx Black with Jet Black Leather ONLY 7K MILES Options Include: DURAMAX PLUS PACKAGE (Duramax 6.6L V8 Turbo Diesel with Allison 6-Speed Automatic Transmission with a 5 Year or 100,000 mile Powertrain Warranty), DRIVER ALERT PACKAGE (Lane Departure Warning, Forward Collision Alert, Safety Alert Seat), POWER GLASS SUNROOF, CHROME TRAILERING MIRRORS (With Power Glass, Power Folding, Manual Extension, Heat, Turn Signals, LED Rear Guidance Lamps, LED Amber Lights, and Memory Equipped Upper Glass), OFF ROAD SUSPENSION PACKAGE (Hill Descent Control, Twin Tube Rancho Shocks), NAVIGATION, BOSE AUDIO SYSTEM, SIRIUSXM SATELLITE RADIO, FRONT AND REAR PARK ASSIST, REAR VISION CAMERA, POWER ADJUSTABLE PEDALS, HEATED AND VENTILATED FRONT SEATS, REMOTE START, POWER SLIDING REAR WINDOW, TUXEDO SOFT BED COVER, SPRAY IN BEDLINER, ALMOST TOO MUCH TO LIST. Contact Kyle Porter at 816-616-2500 or email: kyle@executiveautomotive.com for additional information. Thanks for your interest in our Denali!